I have posted two other time's on how to clean bow hair's, the simplest and fastest way. 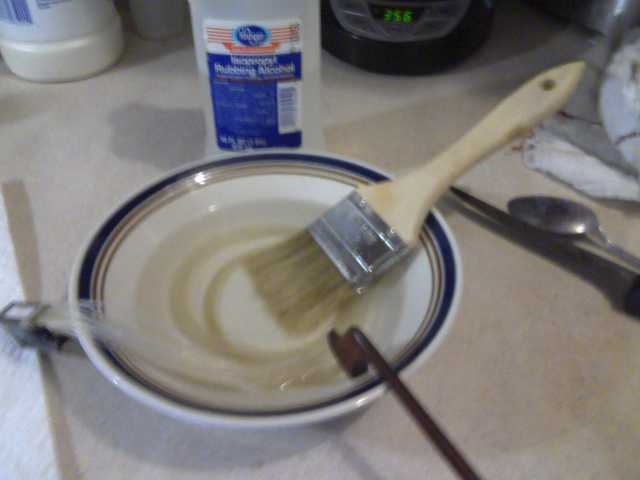 Pour about 3/4 to 1" of "Isopropyl" rubbing alcohol in a bowl. Wind up the bow hair's, submerge them in the alcohol. Use a soft brush to thoroughly dab the hair's. 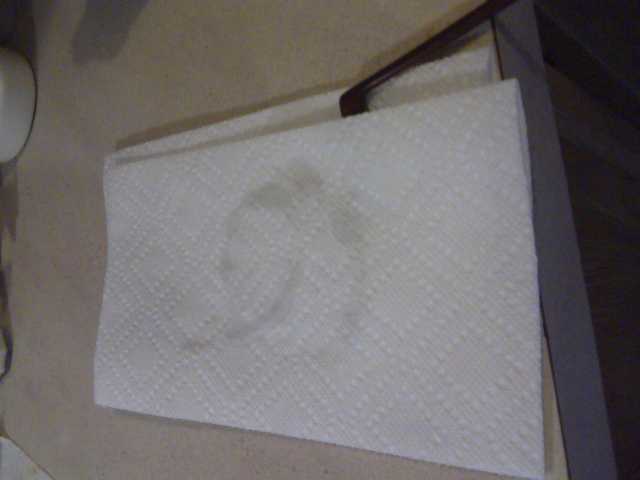 Remove from the alcohol, place on paper towel, cover with another paper towl, dab dry. Remove from the towel's and use a blow / hair dryer to finish the drying process. Hold the end of the bow stick up in the air and rest the frog on a table to seperate the hair's. Finish drying the hair then replace the frog in the slot and screw in the frog bolt. Before replacing the frog bolt, clean the underside of the bow stick to remove any rosin buildup. DO NOT wipe it with the alcohol rag, use a clean dry towel. Rosin buildup on the bow stick can dull the sound. I can clean my four bow's in less than a hour. These pic's are kinda fuzzy, cell phone pic's. look and change to a new towel... repeat as often as necessary to get all the sticky feeling off the hairs. Let dry well and try to play, if you get sound from clean dry strings, keep cleaning the bow hair until you don't. When it's clean it'll be silent across the strings. Re-rosin after drying well and play. Whatever...... the thing is, is I don't have to check to see if the rosin is off,,, one time only thing.. about 15 minute's to clean the hair, includes drying time. Five minute's in the alcohol. People can do it anyway they see fit, I really don't care, just thought I'd show the easiest way I've found. Thanks for the tips, Ken! And how often do You do this? I use my bow about 6-7 months and don't feel like it's dirty... Hmmm should i clean it? I have never cleaned my bow hairs. I need to keep some good excuses for playing terribly. You mean you're not supposed to use shampoo? Detergent (like shampoo) isn't really good at taking out things like resins. If you get pine pitch on your hands, usually you use a solvent to take it off or scrub enough to take off a layer of skin. Rosin (other than the additives) is basically evergreen resin with some of the more volatile terpenes cooked off. Not being particularly water soluble, it may soften a bit with water, but most likely it would just get stickier. 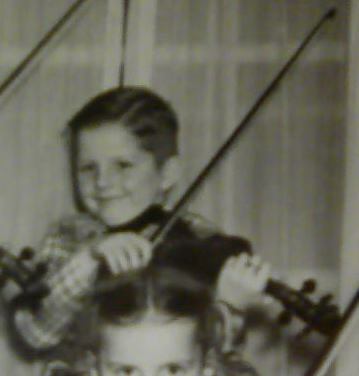 I do recall having seen mention of somebody who shampooed and even used conditioner on bow hair, but that was before it was actually put on the bow. Once rosin has gotten on it though, alcohol is probably about the best commonly available solvent for taking it off. I haven't cleaned mine except to wipe it down with a dry cloth, but I've only had my oldest bow in use for maybe 3 months. I wipe it down every few days, since it is frequently lying out on the kitchen table when there is cooking going on and etc. I thought airborn grease from frying food would be the biggest problem, but so far it seems to be flour. A bit of it gets in the air from making bread, and on bread making days, my bow will often skip like crazy until I wipe it down and reapply fresh rosin. At the risk of being banished, I will reveal that I NEVER clean my bow hair. If the bow acts like it is clogged, I simply hone it with a popsicle stick. IF I MUST get squeaky clean, I attack the hair with the sticky side of masking tape. I rub mine vigorously with a cloth now and again. The same cloth that makes my fillings fall out when I'm using it to scratch my strings clean. I wonder if thats why I sound so shite these days! Clothes are for sissies and do squat on re-frozen rosin. Clothes do remove rosin DUST but it's not the dust that making the racket. In contrast, the popsicle stick has a long and convincing history for bow service. Sounds like there is no competition then, a Popsicle stick it is!! A popcicle stick probably work's just fine for the surface rosin, but does it get the rosin out of the grain / scales of the hair's ? I'm not gonna push the alcohol thing any longer, I know what work's best for me. Do you eat the popcicle first ? Yes but only Weight Watchers ! The popsicle stick actually works to improve the sound quality. I avoid methods that strip off the rosin entirely because I'm too lazy to re-work it back up. The popsicle stick will actually indicate those areas of the bow that may sound raspy and help clean things up. Of course not. As the popsicle melts it gets good and sticky then you don't even need rosin. Now for a hoot on this topic, stop and think about the source. I read up a little on how people wash horse's tails, and some of them (even with show horses) are likely to use almost any sort of shampoo and conditioner. For white tails, some of them also add in some hydrogen peroxide and may even rinse the tail afterwards with water they put a bit of laundry bluing into (bluing is not especially toxic, especially considering one uses a few drops to a whole gallon of water) to make them look even whiter. But that is for horsies that get that sort of care. Mongolia? Horses are a meat animal there, as they are in other parts of the world. So the hair that bows are strung with is probably in pretty rough shape in the slaughterhouse and is most likely washed with something cheap and industrial. In most places probably bleached with something cheap too. Yeah, the nicer stuff is allegedly supposed to be natural and unbleached, but there are so many ways that could be managed without using anything particularly artificial or by using something that isn't officially called "bleach" in the process. Like if a few gallons of Clorox bleach get thrown into whatever vat they rinse them in, it could be called "sanitization" and still be sold as "unbleached" since "bleaching" isn't what they are considering the official purpose of that stage of processing. It would just be a side effect of another process. Terms like "natural" and "unbleached" always sound nice when a salesman uses them, but may actually be rather ambiguous in the realities of international industrial commerce. Especially if nicely white pretty tail hair gets a higher price on the market. I got to thinking about it a bit because I was initially thinking that it might not actually be good for hair to dunk it in rubbing alcohol or high proof ethyl alcohol. I mean, most people wouldn't soak the hair on their head down with alcohol and then expect it to come out nice. Alcohol is a drying agent. It will drive out the water and then evaporate off, leaving the hair very dry and more brittle, which isn't good for hair. But then I got to considering the source, and what most likely happens to the hair before it is on the bow.. and then we're going to rub it down with some cooked pine pitch and repeatedly scrape it across pieces of steel that are thin enough to be as sharp as at least some knives in some folks' kitchens. You wouldn't usually want to do that with the hair on your head if you expected it to stay pretty. LOL So I doubt alcohol will do any noticeable harm, and the hair will probably pick the moisture back up from the air within a few hours anyway. I have to say though, that I do find it astounding how well bow hair holds up to the use we put it to. It is some dang durable stuff, horse hair. You know,,, it's funny that you should mention how bow hair get's so abused. I was going to post that yesterday on how tough the hair actually is, the scraping across steel wound string, banging the hair's on the string's for certain sound affect's we want to attain and for month's at a time. Combined with humidity, the expanding and contracting. It's a wonderfull thing. 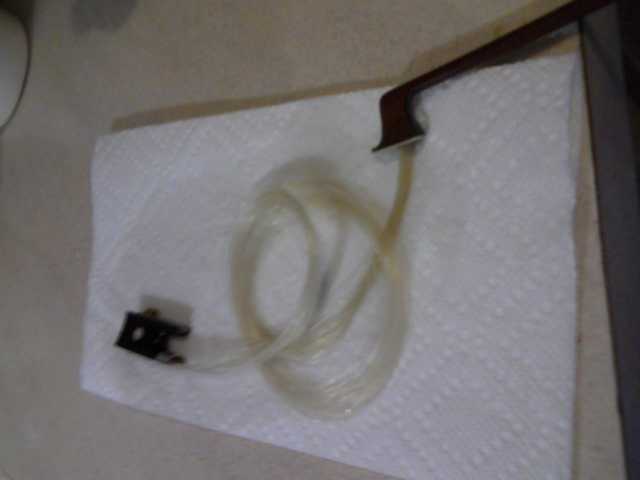 I was very curious the other day when I started to clean my bow hair's. I was thinking about white vinegar as a substitute for alcohol, you know white vinegar is a great cleaner of all sort's of thing's, but I wasn't sure what affect it would have on the hair. I proceeded to call an Equestrian ranch here in Michigan, they raise and breed Arabian's. I asked the lady if white vinegar would harm the horse hair and if not, did they ever use it to clean their tail's and mane's. The answer I got was, they use white vinegar diluted with water to rinse the horse after they finish washing them with mild soap and water to remove any soap residue left over. She said, the white vinegar also keeps the odor's down. I tried the white vinegar and when I finished, it was like I did nothing at all the the bow. It doesn't remove the rosin. About 25 or so year's ago, I saw a TV show about the "Budweiser" Clydesdale horses. The showed how they keep the tail's, mane's and hoof hair's white, they rub them with corn starch after washing and the hair is dry. They said it really does whiten the hair. If you look at bow hair, sometime's you can tell if it came for a stallion or mare just by the color. If the hair's on your bow have a yellow tint on one end it usually indicate's the hair is from a mare horse. The yellow is stained from the horse's urin.